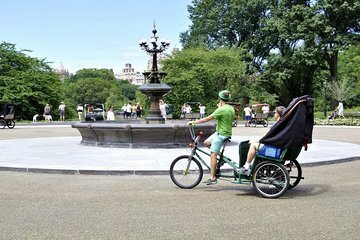 Conheça o Central Park, o parque urbano mais visitado dos Estados Unidos, em um tour particular de 1 ou 2 horas por pedicab. Faça um passeio de lazer ao redor deste marco icônico de Nova York, explorando suas muitas pontes, fontes e estátuas enquanto aprende sobre sua história e design com o motorista / guia experiente. Veja os spots apresentados em mais de 300 filmes diferentes desde 1908 e descubra detalhes interessantes e anedotas sobre o parque. Our driver ‘buddy’ was absolutely hilarious and amazing at taking photos to remember our trip! Thank you so much. Excellent pedicab driver vitaliy prymak. Really knowledgeable and entertaining. Dressed up as an elf. Everyone wanted pictures who went by. He made it a fabulous experience. Would totally recommend. What a fun experience using the Pedicab Tour. The tour guide (bicyclist) was fascinating with all the information he provided about each place we passed. Stopped to take pictures in several spots. Well worth the price. 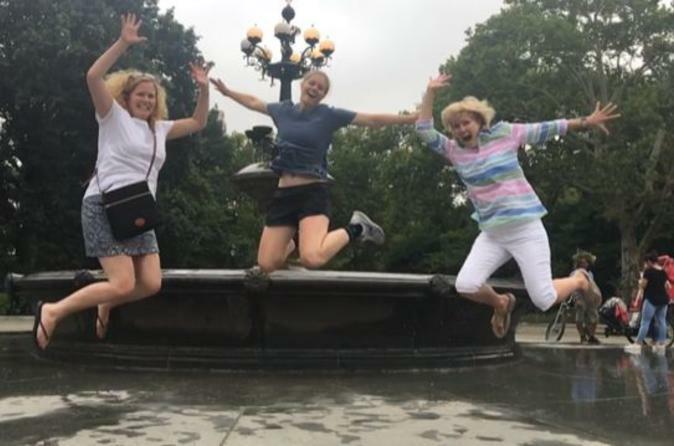 This was our first visit to Central Park and I must say it was a highlight of our trip! Our guide, Vitali, was absolutely the best! He text us before we met just to confirm, then he was right on time at our meeting point. There were several other Pedicabs in the area trying to book us, and by the looks of their cabs I was glad we booked ahead of time! Vitalis pedicab was in great shape and very clean as opposed to many of the others we saw at the street side. It was obvious that he had paid attention to what area of the country we were visiting from by making comments about our hometown! Good, fun comments! He was very entertaining and we enjoyed him along with the park so very much! He was very informative and took the time to stop and take pictures of us at the important places! He even allowed us time to ourselves to walk around and meet back up with him when we were ready! I cannot recommend this tour highly enough! I would take it again in a heartbeat, only the next time I would go for two hours instead of one! I am happy camper! Me and my bf had an amazing time our tour guide Vitaly was very knowledgeable and amazing! He took his time explaining certain historical parts of central park and what I liked about him is he's made the whole experience fun and memorable! I would def give him a 5 stars! I can tell he likes what he does! I would def recommend him when you guys go to nyc! Don’t miss this tour. Was a great couple hours and Vitaliy was very informative and accommodating. He went above and beyond our expectations. Highly recommend. This tour was so much fun! Our guide's name was Vitaly. He did an excellent job explaining all the sites and activities in the park. He also added music when we were approaching places like Strawberry Fields with the memorial to John Lennon, and the fountain in the the TV show Friends. He told jokes along the way and was full of interesting facts. If you book this tour I hope you are lucky enough to get the same tour guide we did.